Alternative Dispute Resolution Practice in India and Abroad. Emerging Issues in Arbitration, Conciliation, Mediation, Negotiation, Lok Adalat, Settlement. Legislation and ADR Practices in Developing Countries. Role of Judiciary in ADR/ Judicial Intervention in Arbitration in India. Scope of Institutional Arbitration in India. Recognition and Enforcement of Foreign Awards in India and its effectiveness. International Commercial Arbitration/ International hubs of ADR. Mediation in Family and Matrimonial Disputes. The above themes are indicative and the author can send the articles on any topic related to the broad theme of the conference. An abstract not exceeding 250 words shall be submitted for consideration. In case of co-authorship, each author will have to register separately in the event of participation in the seminar. Follow a uniform style of citation throughout the paper. Revision (if any) suggested by the reviewer of the paper shall be included. Revisions suggested are on the basis of blind peer review. Selected papers will be published in an edited book following the Seminar. Further details will be provided in due course. 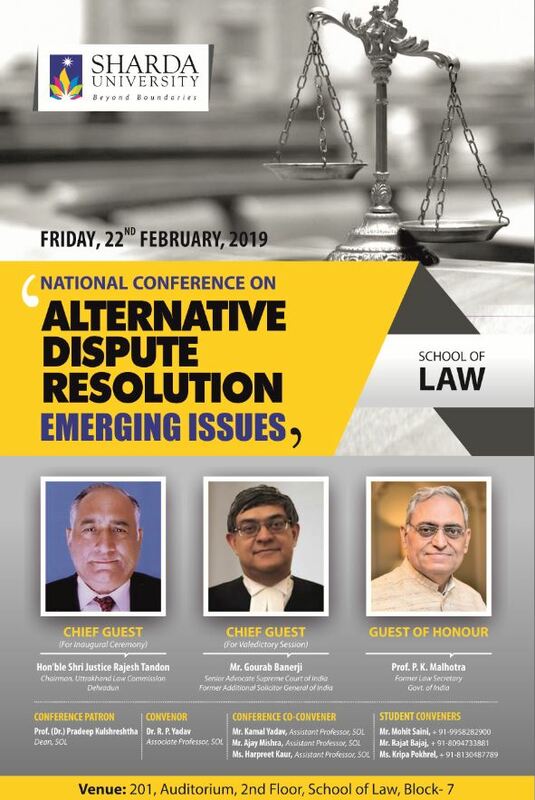 Previous articleRayat College of Law, Ropar is organizing the National Moot Court Competition and Client Counselling Competition on 2019 on March 30-31, 2019.